Thanks to all the Artists, Volunteers, Sponsers and ArtWest 2016 Coordinater Kinstry Smythe who made ArtWest 2016 awesome. Including creative workshops, performances, artist talks, art huis and events for adults and children. All events and performances were FREE. 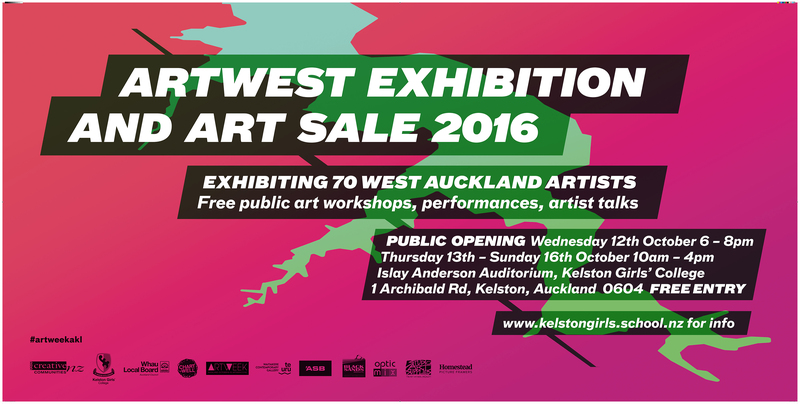 Embracing the breadth of art created in West Auckland the exhibition included paintings, sculptures, ceramics, textiles, photographs, film and installation, with many of the works for sale. Artists | Anne-Sophie Adelys, Edith Amituanai, Ray Blomfield, Mary Botica, Desmond Burdon, Dianne Costello, Joanna Campbell, John Campbell, Mere Clifford, Jack Dawson, Monique Endt, Val Enger, Rachel Eveleigh, Terry Faleono, John Johnston, Andrew Hall, Glenn Heenan, Gavin Hipkins, Sara Hodge, Suzie Horne, Jenny Hunt, Deanna Hulme, Curly Elias Ismail, Karen Kennedy, Ellen Kerssens, Rebecca Kornman, Melissa Laing, Hyojin Lee, Barbara Leikis, Vera Limmer, Ian Loretz, Ros Lowery, Asia Lynn, Peter Madden, Laura Marsh, Pauline McCoy, Lynette McKinstrie, Annie McIver, Numangatini MacKenzie, Marlene Milverton, Kate Mora, Akemi Nakamura, Nalini Nalini, Emma Olphert, Rosanna Raymond, Monique Rush, Rachel Shields, Sarah Smith, Katie Smith, Hank Snell, Louise Stevenson, Jean Stewart, Mike Stock, Leesa Terlesk, Jayne Thomas, May Trubuhovich, Tuafale Tanoa’i aka Linda T, Mino To’angutu, Pusi Urale, Helen Verkerk, Irina Velman and Meek Zuiderwyk. Artwest Exhibition Opening with performances by | Artist, poet, performer Rosanna Raymond and The band Singularity. School workshops | Te Uru Waitakere Contemporary Gallery Education Team, Art in a Box Workshops over 2 days with 6 local Whau schools. Public Art Workshops delivered by West Auckland artists | Katie Smith, Georgina Caulton, Jack Dawson and Mino To’angutu. The Kelston Flag Project | Fashion designer and environmental artist Miranda Brown is launched an interactive public art project at the ArtWest Exhibition 2016. As part of a series of flag workshops, The Kelston Flag Project will engage local audiences to create their own artwork reflecting and celebrating Kelston’s identity. As a community project, members of the public will create an individual artwork. The artwork will then become part of a master artwork that will be printed onto a cluster of beautiful flags. The flags will be used throughout the Kelston and the Whau area for community festivals, events and celebrations. SaVAge K’lub performance | The SaVAge K’lub features a variety of artful and literary entertainments. Exotic tea will be brewed, sumptuous treats will be available for your consumption, and audiences are invited to bring their own regalia. The Whau Arts Meet up | We all do amazing work in our local neighbourhoods and want to grow and support each other. To help us do that (and get to know you all better) Art West and the Whau Community Arts Broker are hosting a meet-up for people working in the arts in the Whau. There will be refreshments and the opportunity to catch up with each other and make new connections. Many thanks to all our supporters, especially; Kelston Girls’ College, Creative Community Schemes, Whau Local Board, The Whau Art Broker, The Chartwell Trust and West Auckland’s expansive creative community.